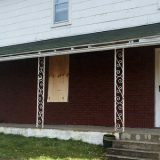 Is Centralia PA haunted? Judging from the above video, some people certainly believe so. On this All Hallows Eve, let’s look at some of the spooky things in Centralia that cause people to think it is inhabited by ghosts. Burning for over 50 years, Centralia Pennsylvania’s mine fire certainly seems like the fiery lair of dastardly demons and spirits. What’s more, the fire heats the groundwater to boiling temperatures, causing steam to rise from the ground. On certain days, this gives Centralia’s landscape an unsettling, misty appearance. 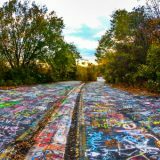 With only a few buildings remaining, Centralia is clearly an abandoned place. Most of the residents left long ago, leaving only trace signs of their lives there. Broken sidewalks, old street signs, old steps leading to no where – all of these give the impression that some paranormal force has driven everyone away. 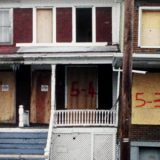 Centralia PA has more people buried there than it has living residents. That fact alone is unsettling. As one drives around the town, three cemeteries can be found: Saint Ignatius, Saints Peter and Paul Orthodox, and Assumption of the Blessed Virgin Mary. The mine fire burning under Centralia has left large patches of ground devoid of trees and life. The fire heats the surface to such a high temperature that tree roots die and the vegetation withers away. These areas are particularly visible in the burn zone, near the southwest edge of the town. Just south of Centralia, lies a nearly one mile stretch of Route 61 that was closed in the early 1990s. Today, the four lane highway is rippled and cracked. In some spots, huge fissures have opened up and sometimes steam pours from them. Most of the damaged asphalt surface is covered in graffiti, which at times appears to depict weird creatures. One of the main reasons people think Centralia Pennsylvania is haunted is because of the 2006 horror film, Silent Hill. 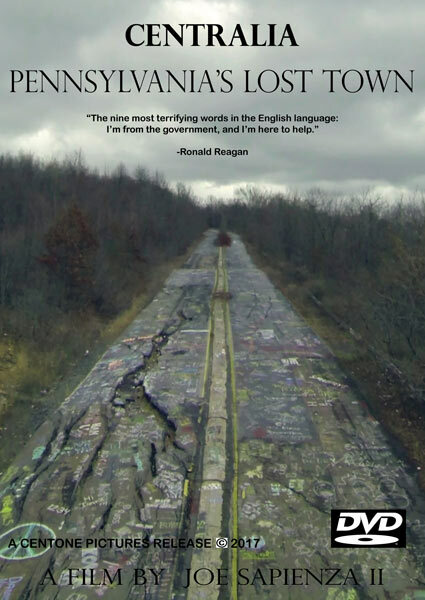 While the movie’s fictional events take place in West Virginia, elements of it seem to directly reference Centralia. These include cracked roads, steam rising from the ground, and dead vegetation. The film’s writer, Roger Avary, has confirmed that he had Centralia in mind when he wrote the screenplay. So while Centralia PA might not be haunted, there are enough bizarre and spooky elements to the town to make someone wonder. Actually the movie Silent Hill is based off the video game. The movie was going off the video game not anything to do with Centralia. Whether the actual game (made in 1999) used that as inspiration for it I do not know. I know you mention about the writer saying he used Centralia as some inspiration, which he may have, but the fact is all of that is in the games. Had there been no game there would have been no movie. I grew up in Centralia as a child on my grandfathers and uncles land known as Chapman hill the home was torn down I still have relatives who reside there I played as a kid in the cemateries with steam coming from pipes …my relatives are buried in those cemateties. 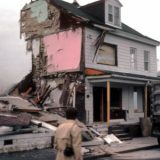 I remember the town as it was yesterday . 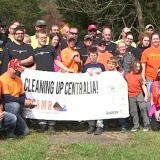 I’m 49 so Centralia was still a town throughout my younger years into my teens and early adulthood. Its still a town but only few reside including my relatives. I think it’s more SAD than scary. Centralia was a nice little town. They had a beautiful Catholic church (St. Ignatius) which was Spanish mission style achitecture and a sweet little Russian Orthodox church with all these domes on top of it. When you think that people had to leave the homes they loved and worked in for years, even if they did get compensation, it’s still very tragic for them. I agree Patrick, I found it so very sad as well. I can’t help but think of the people who struggled to create new lives in a new country, who thought that what they were building would be there “forever.” In Northern MN the mining failed and the towns here are in serious decline, but nothing like what has happened to Centralia. The only scary thing is that one or two bad decisions can result in utter devastation of a community and a way of life. Is there anyway we could get in contact with you. My team and I are doing a project on Centralia and would love to interview you are simple learn about your experiences in the town. So could I go visit there I’ve never been and would like to go see the town or is it prohibited? are you high or something, i live in this area my entire life and that story is not fact like at all. yeah im over a year late but i only just found it. it started because someone was burning trash and the coal vein was caught fire. dont go spreading rumors that are not true. I just found a picture of SS Peter and Paul Russian Orthodox Church on this website. I have had that picture hanging in my architecture office for 25 years. It was from a newspaper article from the 1960’s. My grandfather was V. Rev. Andrew Fedetz who served that church from 1940’s until the 1960’s from his home parish in Shenandoah. Does anyone know If the catholic church called St. Ignatius is sill standing in Centralia? Previous story Who Owns Centralia PA?